PreviousPrevious post:Atelier Alain Ellouz takes you to the top of the slopes!NextNext post:Happy New Year! Whether to meet designers, confront them with their know-how or to guide them in their project, Atelier Alain Ellouz has chosen to open a showroom in each of the cities where he is present. In Paris as in London, Atelier Alain Ellouz welcomes you by appointment or by invitation. When the Atelier Alain Ellouz settled in its premises near the Château de Versailles, its priority was to be able to gather in a same space the production workshop and the showroom. Alain Ellouz immediately realized the importance of having a space to receive architects and designers so they could discover his materials, his creations as well as his know-how. The workshop next to the showroom also creates a bridge between the exhibition of parts and their implementation. « The showroom is a place of dialogue where we show the diversity of our materials and our knowledge to impulse perpetual creation », adds Christel Martin, comanager of AAE. 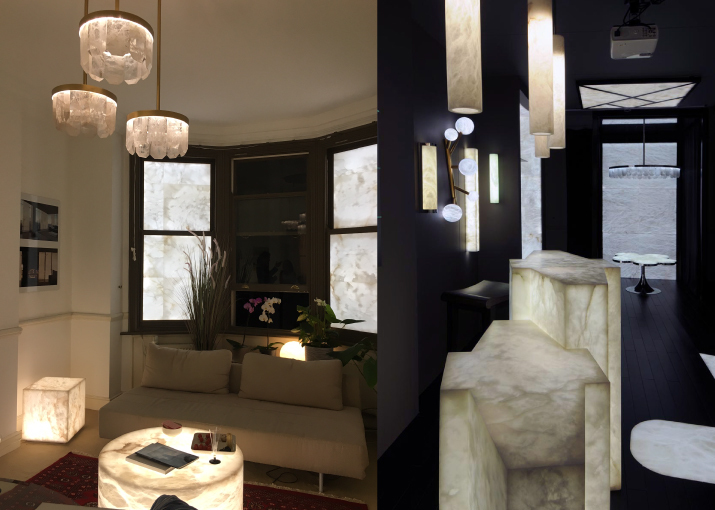 Alabaster and rock crystal are two exceptional stones with multiple variations of lines and light. The showroom allows a visual and sensorial experience that is essential to understand these two extraordinary materials, to feel all their subtleties and to discover the multiple possibilities that they offer. 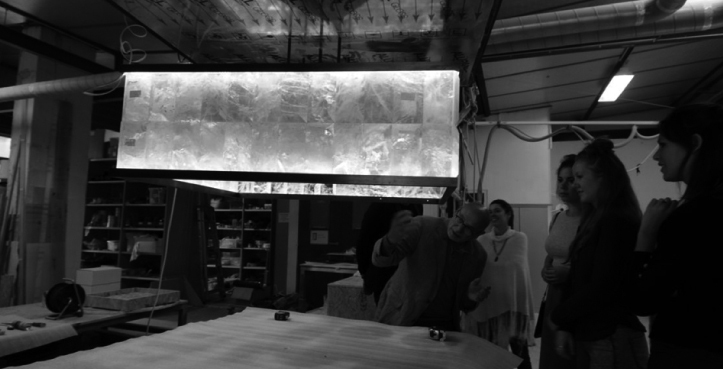 « Alabaster and rock crystal are still quite unknown and the showroom is a great way to approach these rare materials and stimulate creation. » concludes Christel Martin. In 2014, Alain Ellouz is invited to attend a London event. That’s how he understood the strategic interest of his presence in the heart of the European capital of design and architecture, and decided to cross the Channel. Located in a building in the trendy district of Mayfair, the London showroom opened in February 2016 and became the second showroom of Atelier Alain Ellouz. After crossing the English Channel, Atelier Alain Ellouz will cross the Atlantic to open his third showroom in New York, in the heart of Soho. Each showroom has its own identity. 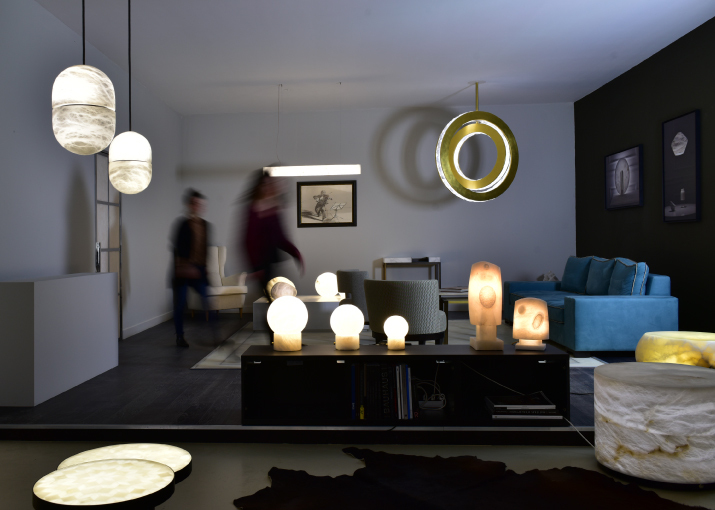 New York will be a real showcase for the lighting collection. But we will tell you more about it soon !